1. George Hunt Speaks in Utah, May 10th, 1991 – Pt. 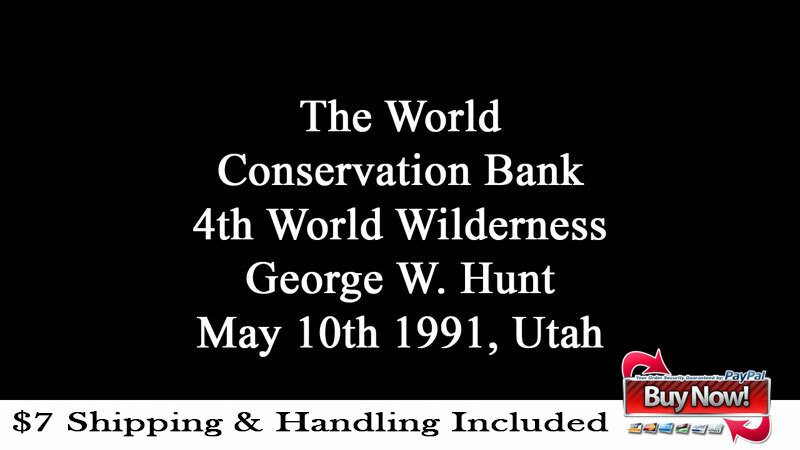 1 – Introduction – George is introduced by the speaker with a little background about Mr. Hunt including his background as a business analysts and his role as a host at the 4th World Wilderness Congress in Estes Park in 1987. To begin George explains his background in religion and how he learned about the 4th World Wilderness Congress and why he first became interested in becoming a part of it. 2. George Hunt Speaks in Utah, May 10th, 1991 – Pt. 2 – Growth and Development vs. the Environment – George continues to explain his part in the 4th World Wilderness congress and how a Christian man got into the congress when all the other hosts were Emissaries of Divine Light from Loveland Colorado and why they didn’t’ want a Christian patriot at the event and from there he sets the stage for how a bunch of bankers were involved with a seemingly “Environmental Congress” which turned out to be a cover for a New World Order bank that presented Growth and Development versus the Environment. Mr. Hunt presents the facts about how the congress planned to use the environment as a way to virtually strip us of our rights and money. 3. George Hunt Speaks in Utah, May 10th, 1991 – Pt. 3 – Attendees – George talks about the different types of people who spoke and attended the 4th World Wilderness Congress in Estes Park in 1987 some of them he notes are James Baker, Edmund de Rothschild, Maurice Strong, David Rockefeller, David Lang, Indian Tribesman, Zulus, and he explains their roles in the events. Proceeding the examination of who attended the congress, George plays a short audio clip recorded at the congress from David Lang who goes on to explain how the investors shouldn’t take the time to explain what they are presenting to the common man but to keep it to an elitist point of view. George then goes on to relate current situations to events drawn out in the bible and other historical events throughout time. 4. George Hunt Speaks in Utah, May 10th, 1991 – Pt. 4 – Assets – George explains how he contemplated going public with the information he is presenting especially after her received threats from various people high up including the Rockefeller’s and the Rothschild’s, who didn’t want his views to be spoken. George also explains his background a little and how he was able to gather the insight on the schemes going on behind the scenes during the Wilderness Congress in 1987. Starting with the major goal of the congress which was to save the Wilderness lands for mankind forever. George presents the official records of the congress that show the wilderness areas they are planning on investing the bank’s assets in. George then describes how he interviewed people at the congress and asked them to explain how this World Conservation Bank planned to make money from unpopulated wilderness areas. I Michael Sweetman being one of the persons that George spoke with and the president of the World Conservation Bank, explained that the 34% of the Earth’s surface that will become assets of the bank will be used for programs such as land swapping for debt as the main asset foundation. 5. George Hunt Speaks in Utah, May 10th, 1991 – Pt. 5 – Capital – George explains the assets that are going into the bank that is being proposed in the congress, including the wilderness lands, third world debt, corporate profits and how these assets are in support of a World Dollar and the Conservation Corps. This moves George Hunt to investigate further and ask more questions about what the banks plan for an earnings engine are and if in reality the bank is bound to go bankrupt and if this is the whole plan to begin with. This is what Mr. Hunt intended to question in the conference and was promised to be called upon but it turns out that the promise was one short lived and gave George the calling to speak out to the rest of the world about his learning’s from the congress. 6. George Hunt Speaks in Utah, May 10th, 1991 – Pt. 6 – Money – George explains how the bank plans to create the world dollar, the one world order. It’s all right here though, listen to what George was saying, and you’ll realize that he knew what was going to happen20 years ago, bailouts, debt swaps, foreign outsourcing, mass foreclosures and in fact the entire back is a scheme to invest in a greater bank that will eventually own everything in the end. George goes on to explain some of the tricks that they will probably be attempting or might even be in the process of then and now. 7. George Hunt Speaks in Utah, May 10th, 1991 – Pt. 7 – Maurice Strong – George agrees that the bank is almost inevitable and something we need but it’s phony and worthless to the people. At this time George introduces us to Maurice Strong and his history as a UN Official and his role in the World Wilderness Congress. George also explains how these big names at the congress intend to create World National Socialism and Maurice Strong being right there in the middle of it all. We then learn more about Maurice Strong and his involvements in more than just science but in religion and his home in Crestone Colorado where he has started a somewhat secret society. 8. George Hunt Speaks in Utah, May 10th, 1991 – Pt. 8 – New Age Religion – George explains the New Age Religion and who is creating it. The first world being US/Europe, then Russia and the Eastern Countries, then the Third World countries and the 4th World are the One World Order/Religion. Mr. Hunt goes on to explain how the world religion will be a collective conscious and asks some contemplating questions about different religions and beliefs and who is ruling the world and the order or and these religions. 9. George Hunt Speaks in Utah, May 10th, 1991 – Pt. 9 – Environment Laws – George talks about international environment laws that will gradually wind down America. Also we learn how the people who are controlling the environment movement are actually the people who are polluting it which is creating a thesis vs. anti-thesis warfare controlled by the synthesis. All relating back to Growth vs. Development. Not just flesh and blood but powers and principalities, the root of all evil. 10. George Hunt Speaks in Utah, May 10th, 1991 – Pt. 10 – 4th World Wilderness Congress – George plays the recording from the 4th World Wilderness Congress of Maurice Strong speaking and introducing Edmund de Rothschild who speaks more about the creation of the world bank and some things they have in plan to help prevent the Global Warming effect. 11. George Hunt Speaks in Utah, May 10th, 1991 – Pt. 11 – The Water – George responds to the speech by Rothschild and examines some of the things he talked about. Saving the environment is one of the topics and George tells about his experience on what they are actually talking about. In the Monte Christo mountains in Crestone Colorado, Maurice Strong was, almost secretly, removing the water from the aquifers under the mountains and trying to sell the water to other countries and companies for a large profit, and after asking around George found that the people didn’t really understand what Maurice Strong was doing with their water so George had to do try and explain to them what the repercussions of allowing them to do this would cause. 13. George Hunt Speaks in Utah, May 10th, 1991 – Pt. 13 – Fire in Your Belly – Rothschild has quoted a poem by Pierre Teilhard Chardin and basically creates his own new way of saying it by leaving out the religious part. George talks more about industrialism and economic development. Then George Hunt takes questions from people in the crowd. 14. George Hunt Speaks in Utah, May 10th, 1991 – Pt. 14 – The Collapse – The World order will pull the plug when we’re ready to collapse and George goes in to an explanation about how they will go about their plan to create this bank. Then he takes more questions from the audience. 15. George Hunt Speaks in Utah, May 10th, 1991 – Pt. 15 – Edomites – George talks about Edom, Herod and Israel in relation to how he is interpreting the conspiracy going on behind this New World Order Bank and brings it all together with his findings. Then he takes more questions about the conspiracy and the Illuminati.